Good Times White Grape Flat Wraps 25/2's 50ct - flavors are Good Times White Grape Flat Wraps - Good Times Grape Flat Wraps - Good Times Sour Apple Flat Wraps - Good Times Strawberry Flat Wraps - Good Times Passion Flat Wraps - Good Times Mango Flat Wraps - Good Times Blueberry Flat Wraps - Good Times Watermelon Flat Wraps - Good Times Fruit Punch Flat Wraps - Good Times Green Flat Wraps - Good Times Natural Flat Wraps Good Times Cherry Flat Wraps - Good Times Peach Flat Wraps packed in 25/2's - 50ct. 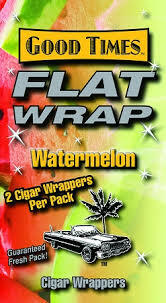 Good Times White Grape Flat Wraps 25/2's 50ct Cigar Wrappers are an extremely superior flavor and always fresh wrapper. 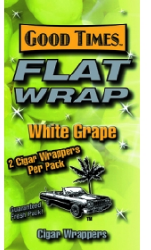 There are 25 individual Good Times White Grape Flat Wraps 25/2's 50ct pouches in each unit and each pouch has two double wide wrappers, you get a total of 50 Good Times White Grape Flat Wraps 25/2's 50ct for an exceptionally low price and high quality product. Good Times Flat Wraps flavors are Good Times White Grape Flat Wraps - Good Times Grape Flat Wraps - Good Times Sour Apple Flat Wraps - Good Times Strawberry Flat Wraps - Good Times Passion Flat Wraps - Good Times Mango Flat Wraps - Good Times Blueberry Flat Wraps - Good Times Watermelon Flat Wraps - Good Times Fruit Punch Flat Wraps - Good Times Green Flat Wraps - Good Times Natural Flat Wraps - Good Times Cherry Flat Wraps - Good Times Peach Flat Wraps packed in 25/2's - 50ct.